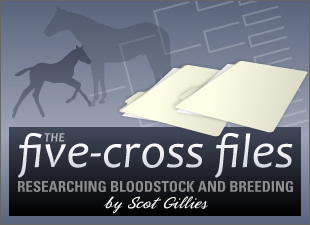 I could talk about broodmares all day, every day -- okay, okay, I DO talk about broodmares a lot! -- but that's only part of the picture when it comes to Thoroughbred racehorses. With all the recent interest in all-weather tracks, I thought I'd do a quick study of the Thoroughbred stallions that are having notable success on synthetic surfaces. I started out on the Breeding/Sire Lists section of BloodHorse.com and took a look at the Leading All-Weather Sires list. I crunched the numbers a little further and eliminated all stallions that were represented by fewer than 20 runners on all-weather tracks, sires that have less than 35% progeny winners from synthetic runners, and sires failing to hit 5% stakes winners from all-weather runners. These are subjective criteria but I felt that they would isolate the sires that have both a significant representation of runners on all-weather tracks and consistent success on the synthetics. There were seven stallions that made the cut. When compared to the Leading All-Weather Sires list (which is ranked by overall synthetic earnings), lhey included everything from the #1 sire all the way down to #73. 1. We've got a tie for #1. Each has 45.8% winners and 8.3% stakes winners from synthetic runners. Exchange Rate (SRO) - This stallion's ranking questions the idea that synthetic sires are likely to be ones that excelled on the turf during their own racing days. Exchange Rate did win a grade II on the grass, but is better known as a miler on the dirt course. Maria's Mon (SRO) - Deceased. What a loss -- Maria's Mon is showing up on a lot of leading sires lists these days. 3. Put It Back (SRO) - The only stallion on the list that stands outside of Kentucky, and by far the least expensive at $7,500 stud fee. 40% winners and 8% stakes winners. 4. Tiznow (SRO) - 37.3% winners and nearly 9% stakes winners. Tiznow is #1 by overall progeny synthetic earnings. 5. Street Cry (IRE) (SRO) - 36.1% winners and an amazing 11.1% stakes winners. 6. El Prado (IRE) (SRO) - 35.1% winners and 5.4% stakes winners. El Prado ranks only #73 by overall synthetic earnings -- sometimes it pays to study the numbers in more depth! 7. Point Given (SRO) - Just made the list for both winners (35%) and stakes winners (5%). I will also give honorable mention to Canadian sire Trajectory (pedigree), whose CAN$6,000 stud fee looks like a nice bargain when considering his 34.3% winners and 5.7% stakes winners on synthetics -- both percentages significantly ahead of his overall progeny statistics. One thing that hit me while I was going through the list was the sire line diversity. Out of seven stallions, we've got two coming from Northern Dancer, one through Danzig and one through Sadler's Wells. Another two come from In Reality through Relaunch. Finally, three are from the Raise a Native line, two of them through the prepotent Mr. Prospector line. From a slightly different perspective, the absence of any Seattle Slew-line sires was a bit surprising. Just because of his reputation and record as a solid, stamina-oriented sire, I'd expect to see sons of A.P. Indy (SRO) further up on the list -- and will look for changes on that front as more and more races are run on synthetics in the coming years. Several individual tracks have gone "all-weather" and more are in the works. The Breeders' Cup will be hosted at a synthetic track -- Oak Tree at Santa Anita -- for the next two years. It's becoming more and more important for breeders to consider this racing surface when planning matings, and we'll continue to watch the sires that are faring well on the new track surfaces. For now, if you're interested in learning more about synthetic racetrack surfaces, here's a great overview study (free PDF download).